Irish No. 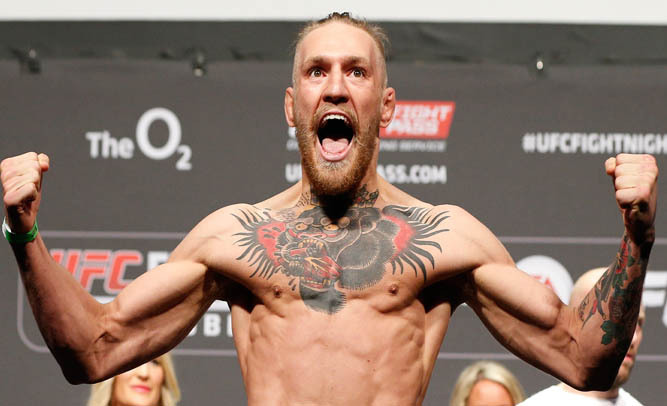 1 contender Connor McGregor has stated that he is ready to make the UFC Gold his own in a unique way. At a press conference in Las Vegas, McGregor stated that after he defeated Jose Aldo for the Featherweight title, he would melt down the belt into a pot of gold. McGregor is set to fight Aldo on Memorial Day weekend, as the headliner for a UFC PPV in Las Vegas. Aldo is the only man to have held the Featherweight belt, and has successfully retained the belt nine times. When questioned about the contender’s intentions, UFC President Dana White seemed curiously on-board with the idea. The UFC gold has held distinction over the last decade as one of the most sought-after accomplishments for combat athletes. Until now, no one had ever mentioned an interest in fashioning the gold adornment to his/her own personal liking. That will all change if McGregor is successful. When reached for questions regarding the challengers intentions, Jose Aldo stared silently into the recording device until the reporter finally walked away.